The Vegan Magpie: Alpro Ice Cream Offer! Hello! A little birdy told me (thank you!) 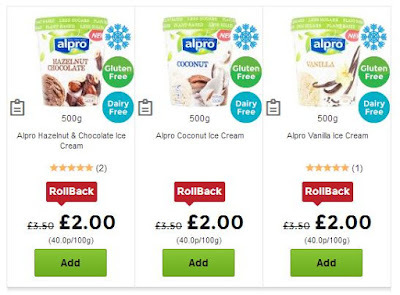 about a particularly good offer on Alpro ice cream that is available at Asda at the moment! All of their ice creams are down to just £2.00, making them cheaper than Swedish Glace. Yum! Asda don't seem to provide an end date for offers, so now would be a good time to try them or stock up if you've already tasted the deliciousness. Since it says rollback, I would think that the offer will be around for at least another week (don't hold me to that though). Asda also have a few other vegan offers at the moment, such as on Alpro milks (4 for £4) so it'd be well worth having a look around whilst your buying ice cream! I very much appreciate people alerting me to offers, so feel free to let me know if your spot any good deals!